In recent years, there has been an influx of menstrual cup washes on the market. Years ago, the DivaWash basically dominated the scene, but today there are a ton of options, including the Pixie Cup Wash. But, how do the new menstrual cup cleansers stack up against the DivaWash? Are they a good value for the money? And most importantly, do they get your menstrual cup looking and smelling as fresh as the day you bought it? Let’s find out more! 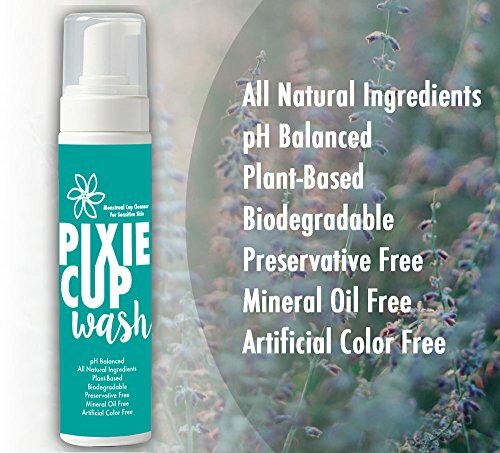 The Pixie Cup Wash is an all-natural product and the ingredients are organically sourced. It’s from the same company that makes the popular Pixie Cup. It’s plant-based, has never been tested on animals and scented with citrus oils. Although a menstrual cup wash is a bit more expensive than just using regular soap, we appreciate that the Pixiecup Wash comes with a foaming pump. This means that you really need to use only a little bit each time, and a single bottle should last you for months. People on Amazon commented that they really liked the smell of the Pixie Wash, more than the other options available. It comes with a foaming pump to create a nice lather. This is the only menstrual cup wash that we know of which does this. It’s also biodegradable, which means you won’t be harming the environment by using this product to clean your cup. People on Amazon commented that it smells really nice, but that it doesn’t leave a scent on the cup. It also doesn’t irritate the skin like some of the other menstrual cup washes. The Pixie Cup company is a small, family-owned business in the midwest of the USA. Here at Reusable Menstrual Cups, we love North American made products. They are made from the highest quality ingredients, according to strict manufacturing standards. Their goal is to put menstrual care products in the hands of as many people as possible. To that end, they donate one Pixie Cup to a person in need for every one that they sell. Along with the Ruby Cup, they are the only two companies we know of who do this. In our experience, the best place to buy just about anything besides the Diva Cup is on Amazon. The Diva Cup, being so popular is readily available at most drugstores, but for anything beyond that, you may waste days of your life driving around your city to find it! Amazon has all the options, colours, sizes, etc. Shipping is often free with Amazon Prime, and the packaging is discreet. Nobody will know that you’re ordering feminine hygiene products! Do you Need a Special Menstrual Cup Wash? Let’s consider whether or not you actually need a menstrual cup wash. This is a great question! In our experience, menstrual cup companies who make a menstrual cup wash often recommend using their product. However, companies that don’t, usually recommend washing their menstrual cup brand with plain soap and water. They mention that they key is to use a mild, non-scented soap and to rinse off any soap residue well. So, do you need a menstrual cup cleanser? Maybe. If your cup doesn’t smell bad, or isn’t discoloured when washing with soap and water, stick with that. If it starts to smell, or is getting discoloured, then consider using something like the Pixie Wash. It can freshen up a menstrual up in no time. Gets menstrual cups squeaky clean! The Lunette Feelbetter Menstrual Cup Cleanser is another top-quality menstrual cup wash from a great company. Based in Finland, Lunette has an excellent reputation for making a top-quality menstrual cup. Their menstrual cup cleanser is of equal quality and has some excellent reviews on Amazon. Similar to the Pixie Cup Wash, it’s organic, vegan, biodegradable, not tested on animals, etc. Pricing is also very similar. The one thing that the Pixie Cup Wash has that the Lunette Wash doesn’t is a foaming pump. In reality, they’re not much different and you couldn’t go wrong with either of these products. You can check out this article for more details about the Lunette Feelbetter Menstrual Cup Cleanser. The next menstrual cup cleanser we’re going to talk about is the Divacup Divawash. This is the most popular menstrual cup cleaner on the market today. It’s made by the top-notch Diva Cup company, who produce the most popular menstrual cup brand in the world. It’s quite similar to the Pixie Cup Wash in that it’s made from natural ingredients. The Divawash will also leave your menstrual cup smelling nice, and feeling squeaky clean. Over on Amazon, this product has some excellent customer ratings and reviews. In reality, you would probably be equally happy with it, or the Pixie Cup Wash.
You can check out this article for more details about the Diva Wash.
What about Pixie Cup Wipes? When you’re in the privacy of your own bathroom, it’s super easy to clean a menstrual cup. You have access to your sink and running water, as well as either soap or a menstrual cup cleanser. However, when you’re on the go, and having to use public bathrooms, it can be difficult. The way that most people deal with this is to wipe out their menstrual cup with toilet paper. However, this can get messy and you may want to use something like Pixie Cup Wipes. Not wet enough. Felt like they were wiping their cup with paper. Some reports of the box being tampered with and some pieces missing. It’s expensive for what you get. 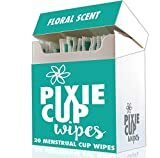 Overall, these Pixie Cup wipes are a miss because they are too expensive for us to consider recommending them. You’d be better off just wiping down your menstrual cup with toilet paper if you had to remove and reinsert it in a public bathroom. Then, clean it thoroughly when you get home and you’ll be fine. Overall, the Pixie Cup Wash is an excellent product at a very reasonable price. We love that it’s made by a small, family owned company in the USA. We also love that they use all natural, biodegradable products that don’t irritate the skin. People that have used the Pixie Wash seem to love it and it has the highest overall user rating on Amazon for similar products. In terms of whether you should buy the Lunette Feelbetter Menstrual Cup Cleanser, the DivaWash, or the Pixie Cup Wash, it’s kind of a toss-up. The Divawash is often slightly cheaper than the other two. However, the Pixie Cup Wash does have a foaming pump which creates a nice lather. This means that you have to use less of the product, so in reality, the Pixie Cup Wash is probably cheaper, per use. You actually couldn’t go wrong with any of them, but we’ll give the Pixie Cup the slight edge here! 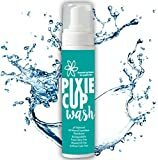 Pixie Cup Wash: Have your Say! Is this menstrual cup wash your go-to brand? Or, are you considering something like the Divawash? Leave a comment below and let us know your thoughts. I’m definitely not a fan of the Pixie Wash, and much prefer the DivaWash!